Last week when I read the press reports on the Verizon vs Vonage patent case, I was perplexed by lack of detail of the patents involved in the case. During the Blackberry case there seem to be plenty of detail analysis available. Clint Ricker had the same thought and spent the time to research the matter. Here is the link to his findings and analysis. This case seems to have many of the attributes of the Blackberry case which in my mind should never have gotten as far as it did and just illustrates how broken our patent system is. Unfortunately Congress has other pressing issues to deal with it and I am afraid this issue will not be dealt with anytime soon. Left with this system, companies will continue to use questionable patents in defensive moves against competitors. You could argue that Vonage is not really a competitor of Verizon's. With only 2.2 million subscribers, they dwarf Verizon's customer base. Verizon's real competitor is Comcast and the other cable companies. With their VOIP phone service Comcast is poaching customers from Verizon. Given the reliability ads Verizon is showing in the Washington, DC area, they are concerned with defection rate. Vonage has been since 2002, yet this lawsuit was only brought in the last year. Verizon chose to attack the middle player in the field which does not have the deep pockets of a Comcast to fight this kind of litigation. The result shows. The problem for consumers is that the ruling affects us. With VOIP services from Vonage, Sunrocket and others, we have been able to save considerable amounts of money and have started to break the strangle hold local phone companies have had. The technology is maturing and from my own experience with Sunrocket, I can vouch that the service has gotten better and better. Although the call quality still does not equal the Plain Old Telephone System (POTS), it works as well as a cell phone service. Should the ruling stand, it could have a detrimental impact on the nascent industry and in the end kill competitiveness for local dial tone service. One last note, as Verizon is deploying FIOS they are urging people to switch their local service from copper to FIOS. At first I thought that this meant VOIP but I was told by Verizon marketing folks that it is not. They could not tell me what technology they were using but I am assuming it is some sort of packet based system tied into their POTS network. After testing Vonage in July, I decided to try SunRocket since they were considerably cheaper. Three months later I am still very satisfied with SunRocket. The majority of calls are excellent and equal to land line quality. There are a few awful connections, however redialing seems to fix the problem. Incoming and Outgoing faxing with VentaFax is working flawlessly. Tivo Series 1 modem connection is working flawlessly. The SunRocket Signature Message Screen works very well to preview incoming voice mails on my PC. I love receiving my voice mails in emails on my T-Mobile MDA, (using Exchange Direct Push) for local playback. I am having trouble with the "find me" feature to my T-Mobile MDA cell phone. My T-Mobile MDA rings, however when I try to pick up the majority of calls are already on their way to the SunRocket voicemail. I have been adjusting the rings but have yet to find the correct settings. It is clear that ring counts don't match up with associated connection delays between SunRocket and T-Mobile systems. I wish SunRocket had an Outlook plug in to dial numbers directly from a contact (one of these days I will get around to writing a simple one). My decision to purchase a D-Link DFL-210 router and place the SunRocket Gizmo (InnoMedia VOIP router) behind it has proved out to be an excellent choice so far. I am able to dedicate 120Kbps of bandwidth for VOIP calls (when a call is active) while minimizing impact on the rest on my network activity. You can read about my SunRocket experience here and my D-Link DFL-210 experience here. Two and half weeks into my 31 day trial with SunRocket (see my VOIP series here), I have decided to stay with SunRocket. I analyzed six areas; the cost, the quality of voice calls, the fax/Tivo connectivity, the quality of the included VOIP router, the functionality of the user web portal, and E911. The clear winner is SunRocket, especially when the majority of your calls are made to the US and Canada. SunRocket offers a 12 month plan for $199.00, which comes out to $16.58 per month taxes included. This plan also includes a $3.00 credit per month for any international call. You can also purchase a $299.00 12 month plan which includes unlimited calling to 41 countries, this comes out to $26.92 per month taxes included. Vonage offers a month to month unlimited USA, Canada, UK, France, and Ireland plan for $24.99 plus $1.98 for taxes for a total cost of $26.97 per month. One item you have to watch for is that many international destinations only include unlimited call to lines. Countries where inbound cell phone calls are not charged to the cell phone user are pretty expensive and are not included in the unlimited plans. To call a UK cell phone for example, the cost is $.34 per minute with Vonage and $.28 per minute with SunRocket. Any way you look at it SunRocket is cheaper. Both Vonage and SunRocket use the Session Initiation Protocol (SIP) and the G.711 standard for transmitting voice. With both services I found some calls to be better than others but none were so bad that both parties could not continue a conversion. As I mentioned before, the calls are somewhat better than cell but not as good as wire line, however yesterday I made a call to France and was very surprised by the clarity. I could not tell the difference from a wire line call. Call quality is related to the available bandwidth on your broadband connection. This means that placing the VOIP router behind the DSL or Cable modem or placing the VOIP router behind a router that can perform bandwidth management is critical. My current setup places the InnoMedia MTA 6328-2Re VOIP router behind my cable modem, once I receive my D-Link DFL-210 router (this router has bandwidth management) I will be placing the InnoMedia behind the DFL-210. Both Vonage and SunRocket support Fax and Tivo. This again is based on the available bandwidth on your broadband connection, since a fax or modem connection will take up 90Kbps. The fax does not always go through on the first try but it makes it within 5 tries. I think I still have some tweaking to do with the fax software, but I use faxes infrequently so this service works for me. I love SunRocket's free Signature number with distinctive ring, Vonage charges $4.99 per month for their Virtual number service. The distinctive ring works very well with the VentaFax software I just purchased. If you receive or send many faxes I would suggest looking a web service like K7 or a wire line connection from your local phone company to avoid too many retransmissions. VOIP technology was never designed to support modems. Vonage has many more choices than SunRocket. I tested Vonage with the Motorola VT2442 VOIP router. I found this router to be far superior to SunRocket's InnoMedia VOIP router in terms of router and firewall options. However both do a good job of handling voice calls. Had I chosen to stay with Vonage I would have probably gotten totally rid of my NetGear FVS-318. I am still getting rid of my FVS-318, but I am replacing it with the D-Link's DFL-210. This router is probably overkill for my use, but I believe I will grow into it, especially the VPN functionality. The InnoMedia just does not have all of the basic router and firewall options I am looking for. Other popular options seem to be wireless routers like the Linksys WRT54G and the Trendnet TEW-611BRP. Both the Vonage and SunRocket user portals are good, Vonage's is probably a little more polished but the options are similar (see my first post here). I miss the click to call application that Vonage has and I will probably end up writing one myself. SunRocket has the Signature Message screener application which is helpful. I like the Find Me Feature SunRocket has but miss the clearly spelled out Network Availability forward feature. The Find Me should work the same but I have not tested it. Update 8/28/06: SunRocket has updated their portal to include a very nice feature that allows you to click to call, save to contact or block numbers on the home page call log. They also added helpful links, making navigation easier. All in all an excellent upgrade. If you are replacing a wire line phone, Enhanced (E911) is very important to replace the traditional 911 service. Vonage and SunRocket offer E911. For E911 to function correctly you must register the address where your VOIP router resides with the VOIP provider. When you place a 911 call the VOIP provider passes the registered address to the 911 emergency center which is responsible for that address. If you move your device to another location, you should register the new address. If you do not and place a 911 call at the new location, the call will be routed to the old location's emergency services facility with the old address information. You could loose precious time in getting help. E911 takes an additional step to access the VOIP provider's database before connecting to the appropriate emergency service number. With wire line service you do not have that extra step, since in most communities, the local phone company has the contract to provide 911 communication services. The other point to be mindful of is being able to dial 911, you are dependent on your broadband connection being available both connectivity and power. The local phone company likes to tout the fact that they can run wire line service longer, this is true but I had one outage after a tropical storm which knocked out power and our wire line phone went dead. We were left to rely on our cell phone. It is important that you take 911 into consideration before switching to VOIP, although E911 is an excellent step forward, the extra address and emergency center lookup step makes it less efficient the traditional wire line 911 service. SunRocket does not offer service in areas where E911 is not available. Clearly Vonage has more experience and is a larger provider than SunRocket. You need to compare features, costs, your available broadband bandwidth. If you are using DSL, you might want to consider Vonage since you are on the lower end of available broadband bandwidth, unless you purchase or own a router with bandwidth management. If you have cable, then SunRocket provides the better value and you should have enough bandwidth to overcome the InnoMedia's VOIP router lack of functionality. 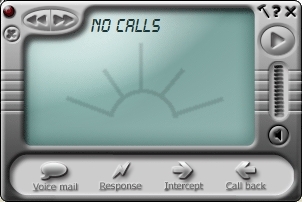 The SunRocket Signature Message Screener is a Windows XP application that allows you to monitor incoming voice mail messages. The application allows you to view the caller id, listen to the incoming voice message in real time, intercept the call and forward to a predefined number. The voice mail, response, and call back buttons do not seem to be active. When a voice mail message is received, the Signature Message Screener will pop up with the caller id and you can listen to the caller leaving a message. You also have the option to mute the incoming message. Once the message is left, a pop up displays a list of messages which have not been played back or just the new one. You have the ability to play back and delete messages from the application. While reviewing voicemails, It would be very useful for the call back feature to be implemented. You must request activation of the application from customer service. Here is the link to the Signature Message Screener's help page. The only limitation other than screen features not being implemented, is that the caller id does not become active when the call comes in, only once voicemail answers. This is a very handy application and one that Vonage does not currently have. When I setup my fax modem and Tivo on Vonage, I had to adjust the bandwidth saver to maximum (90 Kbps) on the user portal. The fax worked fine after several attempts. I was able to get Tivo to successfully complete the dial out test, however since I use a CacheCard in my DirecTV Sony T-60 Tivo and use the ,#401 dial prefix (for Internet based daily calls), I was never sure that my Pay Per View billing information was being sent. For security purposes billing information uses the dial up connection, rather than the Internet. When I periodically checked my DirecTv account during my July Vonage evaluation, my Pay Per Views never showed up. When I switched to SunRocket, I made no changes to my Tivo box. The next day I checked my account and my June and July Pay Per Views showed up. This could just be a coincidence but it did verify that my Tivo works with SunRocket. On the fax side SunRocket uses the T.38 fax relay protocol by default. SunRocket is supposed to detect whether your fax equipment can support T.38 and automatically switch to analog transmission if it does not. I had no problems sending faxes but I could not receive them. The admin capabilities of the InnoMedia MTA 6328-2Re provides the ability under VOIP/User Account to set the "Enable T38 Fax" setting to No. Once I did this, I was able to receive faxes. You can request the admin password from SunRocket customer service or request it via the SunRocket forum here. Modifying admin settings can affect your service and you make changes your own risk. BTW, the SunRocket forum is a very informative site, well organized and great for questions. It allows for a distinctive ring. You can request any available US area code which allows callers from the selected area code to make local calls to you. The Signature number is not an additional line, it is a second number on your primary line. Vonage offers this feature as a Virtual Number starting at $4.99 per month, however they have many more area codes and country codes choices. I chose to use my Signature number for incoming faxes. I setup the Signature Number on the SunRocket user portal to use Ring-2 which is supported by my Intel based fax card. 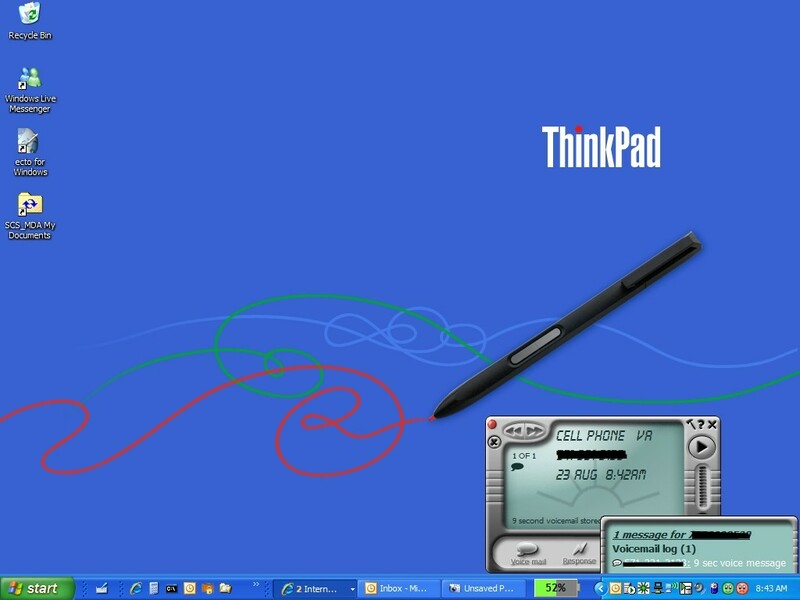 Unfortunately, Microsoft Fax and TAPI in Windows XP has been crippled and do not support distinctive rings. It does work in Windows 98! I found VentaFax, a full featured voice/fax application that supports distinctive ring (you must set VentaFax to answer on at least 2 rings) and can run as a Windows XP service. I run my Media Center PC 24x7 and this now means I can receive faxes anytime without having to be signed on. The business version of VentaFax can also email the received faxes. The voice features (voicemail, auto attendant, etc) are very sophisticated but at this time I have no use for them. So far my trial of the SunRocket service is working out well. When you receive the VOIP routers from Vonage (Motorola VT2442) and SunRocket (InnoMedia MTA-6328Re), they are configured with default passwords. 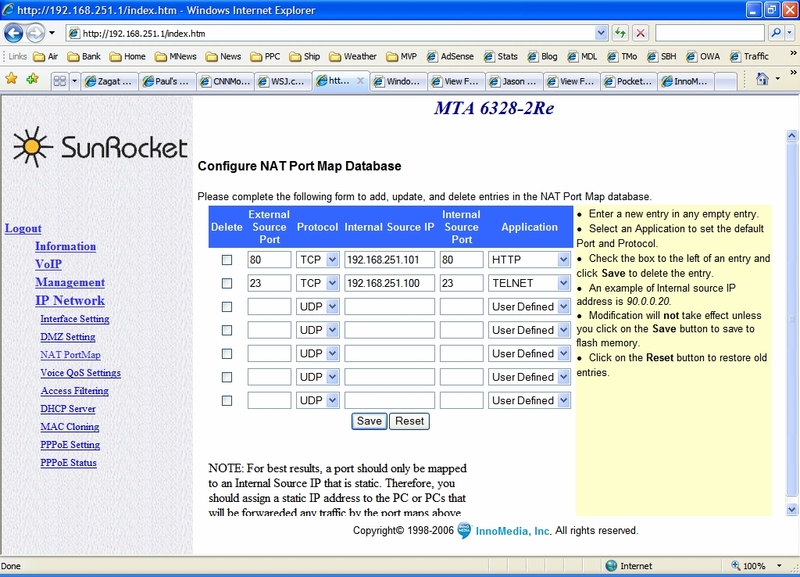 Their configurations can be accessed via the WAN or LAN connections on port 80 (HTTP). The InnoMedia router can be accessed via port 23 (Telnet) as well, I am not sure about the Motorola. This means that if you choose to put these devices behind the cable modem (as I suggest here), anyone who knows the default password can get access to your router via the WAN connection. Changing the default password is critical. On the Innomedia router you have two user ids; "admin" and "user". The "user" user id allows you to modify the router's configuration. The "admin" user id allows you to modify the VOIP settings which contain the SunRocket account information and allows it to make and receive calls. The included documentation does not provide the admin password since making changes could affect your service. The problem is that the SunRocket admin password has leaked onto the Internet and individuals have had their accounts hijacked and received expensive invoices for international calls. I have not heard that the Vonage Motorola VT2442 router has the same problem, however one should implement the solution I am about to describe regardless of which VOIP router you use. The solution is simple, forward port 80 and 23 to a dummy address, that way no one can access the configuration capabilities via the WAN connection. This can be done in router settings and does not involves changing VOIP settings. 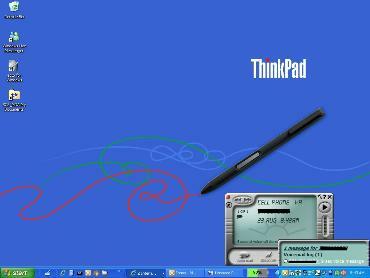 The InnoMedia configuration. The creation of 2 rules suffices to protect the router. Port 80 TCP to 192.168.251.101 (dummy address) HTTP and Port 23 TCP to 192.168.251.100 (dummy address) TELNET fixes the security hole. I also found out that the InnoMedia does not log itself out after a period of time, so it is important to explicitly logout every time you access the configuration. 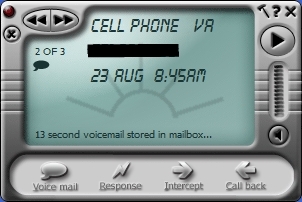 After ordering SunRocket on August 8, 2006, I received the SunRocket VOIP device on August 10th. The email communication was not as efficient as Vonage, however they got the device to me within the same time frame. I replaced the Vonage Motorola VT2442 with the SunRocket InnoMedia MTA 6328-2Re (behind the cable modem), fired it up and it connected within 10 minutes (you need to follow the power up sequence in the instructions). Comparing the web interface between the two, the Motorola VT2442 is clearly the more polished and sophisticated of the 2 VOIP/router/firewall. However on the voice side the InnoMedia seems to be doing the job. My current impression is that the voice quality between the two is similar, better than cell phones but not as good as wireline service. The InnoMedia MTA 6328-2Re web interface can be a little confusing and there is no documentation to configure it. I was able to find the DMZ and port forwarding settings to expose my Netgear FVS318 router sitting behind it. I have noticed that my download speeds (using SpeakEasy's speed test) have been cut in half to about 2Mbps, my upload speeds have remained constant at 353Kps. My web browsing is fine but my file downloads have suffered. I tried adjusting the Quality Of Service (QOS) setting on the MTA 6328-2Re with no real effect. It seems other people have had this problem as well and have resorted to placing the MTA 6328-2Re behind their router. Unless you have a router with bandwidth management or traffic shaping capabilities I think that is a big mistake. For VOIP to work correctly the data stream needs to have priority over everything else. Since we do not have control of the Internet outside our connection to it and the fact that there is no standard QOS solution, it is paramount that we control how the traffic in and out of our personal networks gets prioritized. Routers like the Motorola and the InnoMedia attempt to do that (the Motorola clearly does it better). Unless you have a router that allows for the prioritization of traffic, it is my opinion that in order to get decent voice quality you must place the VOIP router behind the cable or DSL modem. If you have to have a separate router, like myself, two of the most popular consumer grade routers with bandwidth management capabilities are the Linksys WRT54G wireless router and the TRENDnet TEW-611BRP MIMO wireless router. I already have two wireless access points (one upstairs and one downstairs) and a wired Netgear FVS318, so I would like to stick with a wired router. The Netgear FVS318 does not have bandwidth management. Wired routers with bandwidth management are much harder to find. It seems that the industry targets those solutions towards small offices and consequently charge much more for them. If I stay with SunRocket and given the price and current service quality, I plan to, I will be looking at purchasing the D-Link DFL-210. It is expensive at about $300.00 but it has the bandwidth management feature I need plus a full featured VPN server which I could definitely use to connect back into my network. Switch to Vonage, pay more and get the Motorola VT2442. Buy a router with bandwidth management. Live with the reduction of download speeds until InnoMedia provides an upgrade that solves the problem. The current InnoMedia software level is 3.0.75. I did get a response back from SunRocket tech support that they do not have an Outlook client add in at this time but are investigating the possibility. I placed a query on the SunRocket forum about using a SIP API, and was given an excellent tip to use a URL to trigger a call. I will investigate writing an Outlook 2007 add in. Since I was coming up on the Vonage 30 day money back guarantee, I decided to cancel the service. After a little bit of run around and being passed from one customer service person to another, I was able to cancel the service. They are charging me a $39.99 cancellation fee which will be refunded along with my activation and shipping charges once they receive the Motorola router back. Fair enough. Update 8/28/06: Last week I received a refund of $84.93 for the activation fee, cancellation fee and VOIP router shipping charge. However, Vonage does not refund the cost of shipping the VOIP router back to them. The experience cost me $6.70. I have been testing Vonage for about three weeks. After some initial configuration issues (VOIP posts) , the call quality has been very good and the fax/Tivo functionality is working, although the other day it took 4 attempts to get a fax to successfully complete. Looking at my call volume I really do not need the unlimited package, I could live with the 500 outgoing minutes package for $14.95, however it seems Vonage will charge $9.99 to change packages, on top of the $29.99 activation fee charge, and $14.95 shipping charge. My initial fees to use Vonage are going to add up to $54.93. I found this a little steep and since I am within my 30 day no hassle return window with Vonage, I went looking at other alternatives. Comcast, Verizon and AT&T are all on the high end, looking towards the low end I found SunRocket. They seem to get pretty good reviews, I decided to give them a try. They currently have a special for 3 free months of service. For $199.00 you receive 15 months of unlimited US and Canada service (taxes included), a VOIP adapter (they call it a Gizmo), free shipping and no activation charge. That comes out to $13.26 a month. If their service works, this is a tough deal to pass up. So far I am impressed with their web site, it was easier to sign up with SunRocket then it was with Vonage. SunRocket allows you choose a phone number which I found to be a big plus. Both systems have different features and uses different nomenclatures to describe them. Here is my interpretation each features. Both have Voice mail with email. Vonage has a Network availability feature which allows you to set up a phone number to forward calls to in the event your broadband service is down. SunRocket has a Find Me feature which provides the same functionality. I currently have no SunRocket VOIP adapter, but I can receive calls to my SunRocket phone number on my cell phone via the Find Me feature. Vonage has a SimulRing feature which allows multiple phone numbers to ring at the same time. The SunRocket Find Me feature can accomplish the same functionality. SunRocket has more sophisticated forwarding features then Vonage, in addition to the standard forwarding, they also have Do Not Disturb and Group Forwarding. Vonage allows you to turn Call Waiting on and off from their web site. SunRocket has Call Waiting but no web management. Both have the ability to control international calling from their web site. SunRocket has the ability to block anonymous calls or specific numbers from their web site. Vonage does not. Vonage has Virtual Phone numbers, SunRocket has Signature numbers. Vonage has a soft phone option, SunRocket does not. Vonage has Toll Free numbers, SunRocket does not. SunRocket has a web based personal phone book. Vonage does not. SunRocket has speed dial via the web based personal book.Vonage does not. Both have 7 digit dialing within your area code. Both have 3 way calling. Both have Caller Id with name. SunRocket has the ability to block the outgoing Caller Id from their web site. Vonage does not. Vonage has a Windows XP application and Oultook plug in to simplify dialing. I have emailed SunRocket support but have not heard back yet. Vonage has an adjustable bandwidth saver option on their web site which I set to high (90Kbps). SunRocket does not. In general the Vonage management web site is more polished, however the SunRocket site is easier to use. On 8/8/06 I ordered the SunRocket service and VOIP adapter. The order process was easier then Vonage, but the follow through has not been as good. I received one blank welcome email from SunRocket and as of now no shipping information for the VOIP adapter. Right now the only feature I would like, which I have not found with SunRocket, is the Outlook plugin. I emailed SunRocket support to inquire about the Outlook plugin, I received one automated email, but as of now, no response. I will update this post as my order and test progress. I thought I had both plugins working together from my last post on the subject. 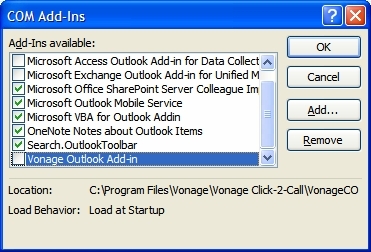 Both work in Outlook 2007 as COM add ins, however when I display the contact view the Business Contact Manager add ins crashes it's menu item and an annoying popup displays every time you change views.Most of the user functionality still works through the contact view and icons but since the menu is gone there is no way to get to the administration features. By disabling the Vonage Click-2-Call add in, under Tools/Trust Center/Add-ins/Manage COM Add-ins the Business Contact Manager add in works fine. I don't know which one is the culprit but I need the Business Contact Manager more than the Click-2-Call add in, since I can still use the standalone Click-2-Call application by cutting and pasting the phone number I want to dial. I may try my hand at writing a simple plug in using the HTTPS format described at Vonage's developer center to access the Click-2-Call service. Last week I was having a terrible time calling 800 numbers, it seemed to be hit or miss, I would reboot the Motorola VT2442 Voice Gateway, however that did not always resolve the problem. I called Vonage tech support on July 20th, only to be disconnected when trying to get to second level support. I then tried to hook my Sony T60 Directv receiver and initiate a daily call. After a hour of research and trying multiple options, I could not get Tivo to successfully connect. I tried again on the 22nd, to discuss the 800 number problem which I thought might be related to the Tivo problem. This time I was able to get through to the second level and was quickly passed on to third level. It appears that first and second level are based in India and third level is based in the US. The tech setup a debug trace on my to view what was happening. When I dialed an 800 number digits were being dropped and there was no clear reason for it. After about 2 hours we started focusing in on the Motorola VT2442 configuration. I had chosen only to use the Network Address Translation (NAT) feature and turn off the firewall feature, Since I am using a Netgear FVS318 behind the VT2442 to secure my private network, Ithought there was no need to duplicate firewall processing by having the VT2442 inspect every data packet. However in order to use port 80 on my Netgear FVS318 router, I had to turn on the De-Militarized Zone (DMZ) feature in the VT2442. After resetting the VT2442 back to it's defaults (firewall on, DMZ off) everything worked fine. It finally dawned on me that the definition of a DMZ is a network that is between two firewalls.An external firewall connected to the Internet and an internal firewall connected toa private network. This meant that the DMZ feature needs to work with the VT2442 firewall feature turned on.Now I have the VT2442 firewall and DMZ features on and everything is working fine. I successfully tested Tivo and was able to use my Intel based fax modem. I use a Cachecard in my Tivo which allows it to perform the daily call (it's really once every 5 or 6 days) via the Internet, however when you make a pay per view purchase, Tivo sends the billing informationusing the modem. I am guessing this isprobably for security reasons. The quality of the calls have been good and since I made the change I have had no problems. My next step is to test Vonage with my alarm system.